NOTE: This is an old review and my thoughts have changed somewhat. May revisit after a rewatch. As many reading this may already know, back in 2011 when it aired Madoka Magica became a pretty big deal, and it continues to grow and draw in Anime viewers both casual and experienced. It’s easily one of the most influential things to come out of Anime in the 21st century. However, with influence things tend to also get backlash, often to some extent irrational and arbitrary backlash that’s more gripes with a rabid fanbase than the substance of the product. I watched the series for the first time in August of 2012. On my first watch I was partially influenced by some who were cynical about its popularity, not to mention I had already had most of the series spoiled to me. I considered it largely overrated albeit still a very good series. About a month later I went to a convention and became interested in rewatching the series after a significant number of Madoka cosplayers sparked my interest in it. Rewatching it gave me a much better impression on the series, and I eventually considered the series an all-time favourite. It was challenging, it was emotionally powerful, it was complicated but simplistic in expression, it was visually and sonically brilliant and most importantly of all it had an astounding impact on me. I’ve rewatched the ending 5 times now, and every time it takes me several days to simply digest it. I knew the third movie was on its way, and quite frankly I wasn’t the least bit sceptical about how well it would turn out. I wasn’t going to allow myself to be cynical and to already be put in the mindset that it was going to be inferior to the series. While it was undoubtedly a business-minded decision, SHAFT and Urobuchi are not business-minded people. They are creative-minded people, the same creative-minded people who made the original series, and this movie undoubtedly still has the same aspects that make the Madoka series so profound to me, and I’d be willing to argue that for the most part it’s matured and handles certain aspects even better than the series. The story is where the growing maturity of the series shows most clearly. The early sequences are as vivid and whimsical as you can get. Right from the get-go it’s rather unsettling because things aren’t as they were when we last saw the Magical Girls. Following that sequence, all five Magical Girls unite and get in even more whimsical adventures with some wondrously expressive and unique transformation sequences. We see a simple battle sequence and then we get an upbeat song. By this point you really don’t know what to expect. The less mature viewer would have given up by this point and claimed the movie was retroactive in its continuity and utterly incoherently stupid. The sensible viewer would instantly pick up on the fact that this direction is intentional and remain patient, giving enough credit to believe that the creators have an inkling of awareness regarding their own product. It creates the notion that everything is fine and dandy, but as the movie progresses the score and the visuals very subtly give you the idea that it isn’t. The exposition of this is flawless. The sequence of events is dense and meaningful, and the pacing spot on. The world around Homura slowly starts to distort. The visuals become more and more abstract and Kajiura’s score becomes increasingly haunting, digging further and further and never allowing its attention to stray. The score and the visuals are essential in setting the subtle and obvious changes in tone throughout the movie. Eventually we get to what’s really happening. Kyubey gives an explanation of this in significant detail, perhaps the second most divisive part of the movie. I find myself intrigued by Kyubey’s cold nature of speaking, and while some may be uninterested in this due to the detail he speaks in, it’s something that’s carefully simplified while still retaining every fine detail, as it was with the original series. Homura, who has shown herself to be increasingly irrational in her behaviour throughout the movie, tries to transform into a witch. Madoka intervenes with the rest of the Magical Girls to rescue Homura at the climax of the movie. The visuals and the score have reached their peak of haunting abstraction by this point, creating what can only be described as an out-of body experience. Following the climax we get to what is most certainly the most divisive scene in the movie. 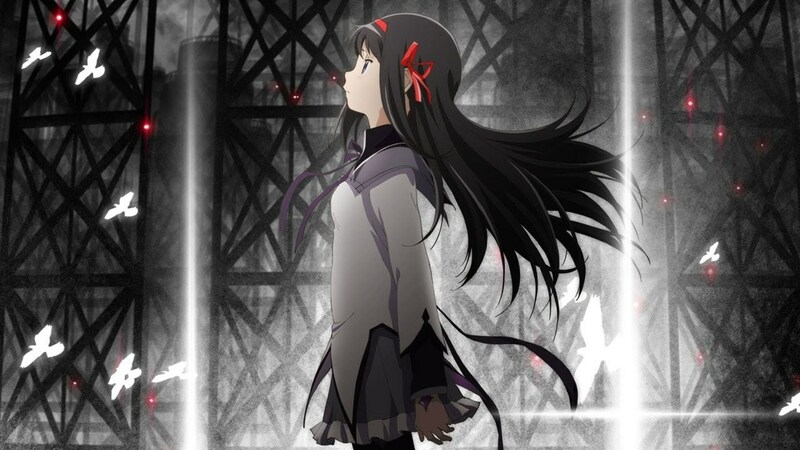 Homura, who has far surpassed hope and despair, becomes so powerful in her emotional state that she rivals Madoka in power, taking control of reality and rewriting the laws that Madoka had created. While some may think this is purely selfish and moronic, take into consideration the full scope of actions and consequences. Had the law of cycle remained, Kyubey would perpetually attempt to thwart it and would likely eventually succeed. Homura’s power born purely out of her own emotions was a catalyst, one which made Kyubey realise the full extent of human emotions and the risk it imposed if he were to take control of them. Homura doesn’t bring about any significant harm to anyone she cares about either. Homura at this point is essentially an anti-incubator in that while she’s implied to be evil like the incubators her intentions are born from the exact opposite cause; a reaction based solely on emotion compared to a reaction based on a complete and utter lack thereof. Yes, it was fuelled by irrational desire, but it was an irrational desire that clearly existed and developed. Not only does this development make sense, but to top it off it’s also a very powerful continuation. Anyone who considers this final scene in the broader scheme of things will realise that this is more complete in what it expresses compared to the series. The smaller conflicts eventually fell to the larger conflicts, and now we see there’s a balance of hope and despair. Much more bittersweet than outright bitter. While Madoka Rebellion may not be quite as emotionally impactful as the series, it’s hard to criticize it for that when it does so many things better. It’s not a movie for the impatient, but at the same it’s certainly not jaded. As a whole, Madoka Rebellion is an astounding progression of the series on almost every front.